This year, The Otomotif College (TOC) is celebrating its 10th anniversary. 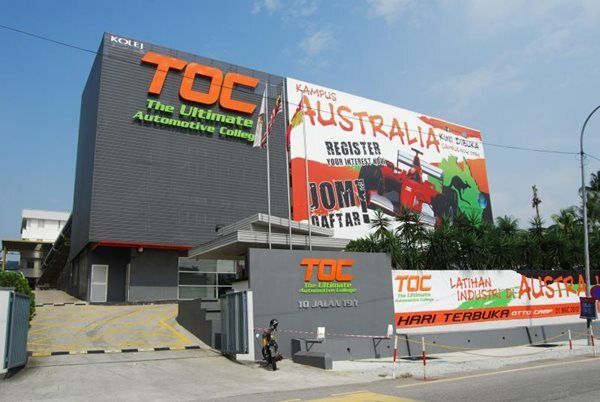 The college has a state-of-the-art campus in Petaling Jaya and offers high quality automotive and motorsports courses. It has renowned university partners in Korea, United Kingdom, Australia and the US. Its CEO and founder, Adelaine Foo, looks back at what the college has managed to achieve in the past decade and what lies ahead. After 10 years, is TOC where you had envisioned it to be? I would say, yes. Our vision when we started was to give technicians a career they can be proud of. I am pleased to see many good students from privileged backgrounds joining the industry. We also see our graduates staying on in the automotive industry, because they are prospering and remain passionate about it. At TOC, it is all about creating a new generation of automotive professionals who are highly mobile and employable, with highly in-demand skill sets that enable them to succeed anywhere in the world, unconstrained by social or geographical boundaries. How different is the market environment now compared with 10 years ago when you first started? There is definitely more competition now. Students have more choices of training providers to choose from. They are also more informed about what to look out for in a training provider. From the employers’ point of view, their expectations of a technician have also changed and are more demanding in terms of skills. Therefore, we need to continue to improve to stay ahead of the game. What are some of the proudest achievements by the college over the past decade? We are proud to have been very highly rated by government and accreditation agencies, whether locally or internationally. For example, TOC has been given premier status by the UK-based Accreditation Service for International Schools, Colleges and Universities (Asic). We understand that only 5% of all universities they accredit around the world are accorded this status. We are also rated five-star by JPK (Department of Skills Development) and by Malaysian Quality Evaluation System for Private Colleges (MyQuest). We have also been approached by several local and international companies to be the benchmark for automotive training. From the human aspect, which I always find more valuable, it is wonderful to hear stories shared by our alumni on how life has changed for them because they have graduated from TOC, how they valued our training and how much they have learnt from us. I was at a night market buying a longan drink from an old uncle. He asked if I was a TOC student as I was wearing my uniform. You know you have done something right for the industry and for the students when you hear stories like these. What are some of the challenges that still need to be overcome? There are definitely those who still look down at a career in the automotive industry, or that it is just a paper chase and there is no difference between one college and another. There is still a lot of work to be done in terms of educating the public on choosing a college that offers good training. How do you plan to overcome these challenges? By ensuring that we keep producing success stories among our alumni. Our students can vouch for us. How does TOC plan to keep ahead of your competitors? By staying true to our aim of giving the best training, we can equip our students with all the skills they need to be good technicians. Our focus has always been on top training quality, ahead of profits. We put the money where our mouth is. Where does TOC go from here? We plan to have more formal exchanges of students and teachers with our university partners. Now that we have had some measure of success in making a career in automotive attractive and something to be proud of, we would like to expose them to an international environment. We want to tell our students that an automotive career gives them the opportunity to break free from geographical boundaries. The entire world is just a grain of sand in the palms of their hands. They can look beyond Malaysia and build a successful career anywhere in the world as they will always be in demand. It is funny how this came from a poem that I had quoted to our ex-prime minister Tun Dr Mahathir Mohamad 10 years ago, and we have now achieved it without knowing! We are also proud that we are a Malaysian college that has managed to set up a branch in Australia, when it has always been the other way around. What is your outlook for the Malaysian automotive industry? Employers and consumers will be more educated and demanding of the skills required of their technicians. This is a good thing and really how it should be. I hope that salaries will rise in tandem with the higher expectations.